Depend on Ferguson Truck Center to help keep your inspections up to date. Make no mistake, one little sticker can stop a truck cold. Keep yours rolling. 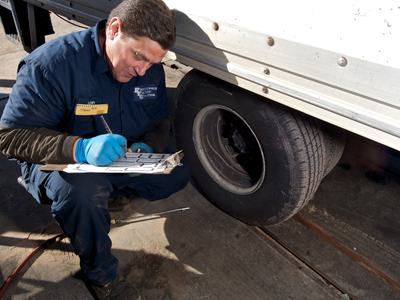 Ferguson Truck Center provides both DOT Commercial Inspections and Federal Commercial Inspections. Best of all, once we inspect your vehicles, we’ll automatically track your expiration dates to give you plenty of warning when renewal time comes around again. Schedule your next inspection now. Fill out this form. Send it in. We’ll get in touch to schedule your next inspections. Or, call us at 713-237-0044. Either way, you can plan ahead knowing we’ll have space waiting when your truck arrives.